When you're towing something, you need even more protection than normal. Well, you got it with Blind Spot Monitoring. This feature comes with Rear Cross Path as well as Trailer Detection. Combined, these electronic aids work together to scan blind spots behind your 1500 to provide safer maneuvering. The feature also senses and accounts for the trailer's length automatically. 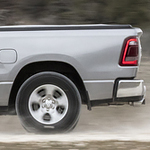 This pickup has more than 100 safety and security features, and it's the strongest Ram 1500 ever. That's due to a frame with a composition that is 98 percent high-strength steel. Find out more when you visit Mike Molstead Motors. Drop by, and take a test drive around Charles City.